I’ve heard rumor of writers I know being paralyzed by writer’s block. But I get more of “writer’s overload.” I have too many things I want to say, far too often. So, as I began to contemplate what to say for another Things We Enjoyed This Week post, well, I was stuck. I suppose one could say this is writer’s block… but really, I had so much I could share, I was overwhelmed! The “stuck” part came when determining which (if any) of them would be a fit for a post Ms. Cheevious. That was a quagmire. I’ve had some really amazing things going on this week, and over recent weeks, not least of which is the publishing of my book “Ahhhhhh … Haaaaaa Moments with Ms. Cheevious” for Kindle (please feel free to click that link and “like” my book on Amazon, if nothing else)! But also, I’ve taken on a cool new client who is opening a 1920’s themed night club, I enjoyed football even though my Patriots lost, I saw some fantastic and laugh-so-hard-I-cried comedy… I saw two great flicks, other people I know enjoyed other films… and it goes on and on! There was chatter online and around me about many things, and I enjoyed reading or hearing it all, but nothing was really striking me… until today. I think I clicked the tweet, because I wanted to know if Jason wrote a post and then, perhaps I would share it in return for all his tweets and retweets on my behalf. I was immediately taken to another blogger’s (not Jason’s) site, who was obviously another benefactor of Jason’s. The blog is Melissa Say What?. 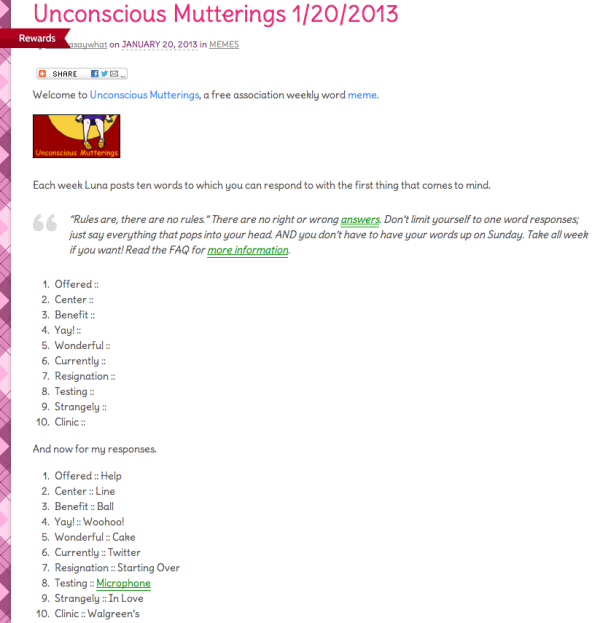 The post is called Unconscious Mutterings. She shared a free association word game. You see a word, and respond with the first thing that pops into your head. This was IT! I loved this! And here, my lovelies is what sums up the Things We Enjoyed This Week: Mutterings…. 10 Responses to "Things We Enjoyed This Week: Mutterings"
thanks for referencing my tweets Lisa, you always post great things that I love to share. These are the type of relationships that always keep me coming back to twitter, and why I love it so much. Thank you! This was fantastic. I love those word games as well! Thanks Luann. You are fantastic! You said “quagnmire”! Now that should totally be added to the word association list! LMAO! I love word plays and, no, you shouldn’t be committed. Just keep being publicly fabulous and smile on! For one of the words “Snuffuluffagus” actually popped into my head! Anyone remember that character? I’m a little concerned…. lexicographer fearful of really letting go. But who am I to say? And you? Best things I did all week were to nickname the cat “Sturber” and to write a satisfactory recollection of my great-grandfather. Thanks for your motivation! and said it cost a lot for gas because it gets only 14 miles to the gallon. He was very nice to me with my language limitations – a good experience. and you say you are a dull lexicographer… Pffff! THanks Eame! As always — fabulous!